We all want to grow. Understanding the trade-offs faced while growing will make the journey as smooth as possible. Without understanding the risks involved with these trade-offs, it is impossible to understand the potential long-term repercussions of our decisions. Financial growth and technological innovation are both equally important parts of a business. However, they often come at odds with one another. We’re programmed to look at financial success on a quarterly basis. The issue with measuring growth based on short-term financial returns is that a product is penalized for investment . Most overhead costs for a software company are in development. An easy play to show higher profits is to cut costs. However, if product development is sacrificed for profit, cracks in the system begin to surface, and velocity plummets. The larger a product grows in size, the larger the impact cuts to development will have. Product growth needs to be supported by additional investment in development due to the increased complexity of the product. A small product may be able to survive with a small team, but as it grows in complexity, the team will struggle to keep their heads above water. Another issue with looking at the success of a product through a linear financial growth model is that it doesn’t take into account that markets are not infinite. What happens when that market nears saturation? Financial growth slows. However, the company could still be bringing in huge annual revenue. They are faced with a dilemma: be satisfied with their market and own it, or find new avenues for growth. How do they define success? Even massive international companies have market limits. Look at what is currently happening to Apple. Apple’s growth is slowing as the smart phone market matures. That doesn’t mean they are unsuccessful, or that the market is dead. Businesses become naturally slower as they grow, as the added complexity limits their ability to do things they could in the past. As a product grows in size and complexity, the business surrounding it must also grow to be able to manage it. As the business grows, additional layers of management are required to maintain control of decision making. However, excessive red-tape results in bottlenecks, the enemy of agility. 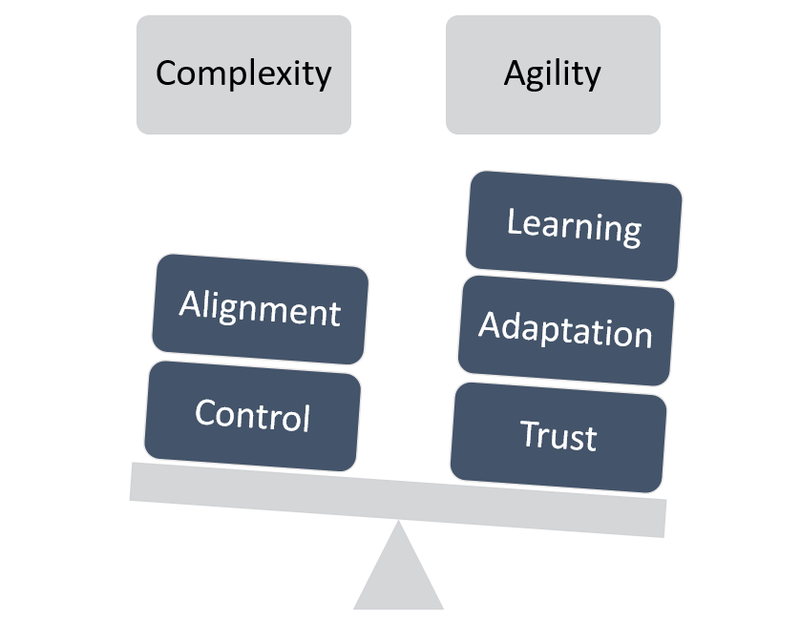 Many large organizations are paying big dollars to go through agile transformations, but the majority of them are failing. Ironically large companies look to add process to make them more agile (ie. DevOps, Scrum, etc.) when in reality they should start by removing the processes that are decreasing agility. This can be tough to stomach, as it requires a level of control to be given up by management. This is a human bias at play, the intervention bias. We have a tendency to fix situations deemed as broken by adding a solution, rather than by subtracting barriers. The reason we do this is that it gives us the illusion of control. Uncertainty is perhaps the single largest obstacle for product teams. Studies show that the more complex an environment is, the less accurate. As both the product and business grow in complexity, they become more unpredictable. It is impossible to predict all of the positive opportunities or negative circumstances that a product will face in the future, so focusing on product resiliency is beneficial. The more ‘cracks’ a product or business model has, the larger the impact a negative situation will have. Since we can’t predict when negative situations will surface, focusing on resiliency is quite beneficial. Technical debt makes products fragile, as it leaves cracks in the system. Excessive red-tape makes businesses fragile, as it does not allow teams to be responsive. When things go wrong, cracks have a tendency to create a chain reaction of problems, leaving companies in fire-fighting mode. Small Customers: Understand they are sacrificing some functionality and customization, in order to save money. They are price sensitive above all else, which allows for a prescriptive delivery model. Large Customers: Have money, are willing to pay more but expect the software to meet their specific requirements. Customization is often required. The sales and implementation cycle is much longer. Delivery of the product to large customers is higher-touch, and requires more staff to be hired. This results in the business increasing their prices to cover their new overhead costs. This can force the business to evacuate their initial niche market, as the small customers can no longer afford the product. There is a risk in evacuating niche markets — it can open the door for innovative new products. In technology, the risk of disruption is greater than ever. Overhead costs of starting a new product are extremely low, meaning new entrants will constantly be appearing, and they will be aiming for niche markets. Product resiliency focuses on limiting the amount of downside, which in turn allows the product to take advantage of opportunities with upside. Survival is often the best long-term play, as it allows you to move onto the next opportunity, which may end up being the opportunity that you’ve been waiting for. From a financial standpoint, resiliency can be achieved by finding a business model that allows delivery to markets of multiple sizes, as this allows the business to hedge their bets. The small market will bring lower revenue per customer. However, there are more potential customers. Losing a small customer isn’t a big impact on your bottom line, and there is a higher potential for finding a new customer to replace the lost one. In large markets, the revenue per customer is high. However, losing one can crush your bottom line, and there are fewer potential customers to find a replacement. Remaining in a small market, while simultaneously moving up-market, can provide a level of business stability. The small market provides stability at a low(er) risk; the large market provides the chance for huge upside, however, it comes with a much higher risk. The stability of the small market customers offset the impact of a large customer leaving. There is an additional benefit of finding a way to deliver your product to customers of all sizes — creates a competitive moat that protects you from disruption by making it very tough for new entrants. Welcome, please subscribe to our mail list.